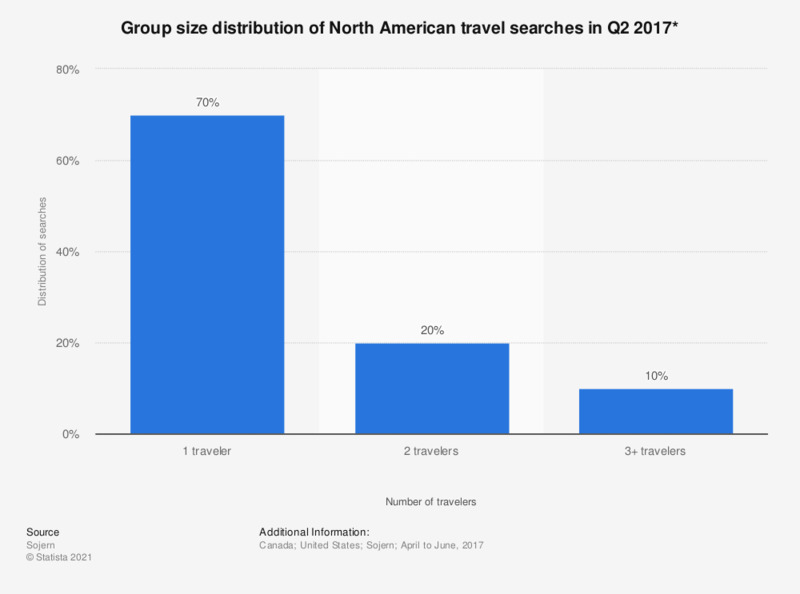 This statistic shows the group size distribution of North American travel searches during the second quarter of 2017. During this period, 20 percent of North American travel searches were performed to reserve bookings for two people. * The number of people traveling on the same reservation. Sojern’s quarterly insights reports are based on the rigorous analysis of more than a billion traveler intent data points, obtained through Sojern’s unique partnerships with some of the world’s most renowned travel brands. The insights available through this analysis enable brands to deliver the right messages to the right traveler at the right time through display, video, mobile, and social advertising. Our analysis is based on airport level data which is then aggregated to countries and regions. All of the insights are based on very specific data sets as provided by Sojern's data partners.